There was an interesting blog post written by Dave Cournoyer at his site daveberta.ca recently about the future of Rexall Place in Edmonton, Canada. For the initiated, Rexall Place (as it is currently named) was opened in the mid 1970s and, though it has hosted numerous concerts, performances, and sporting events in its 40 year history, it is most famous for being the long-time home of the Edmonton Oilers of the National Hockey League (NHL). In particular, the arena housed the Oilers during their “Glory Years” in the 1980s and early 1990s when, led by hockey superstars Wayne Gretzky, Mark Messier, Paul Coffey, and others, the team won five Stanley Cup championships in seven seasons. The arena, arguably, has significant heritage value, in large part because of the Edmonton Oilers, though perhaps to a lesser extent because of aspects such as its architectural value, it role in other sporting events such as the annual Canadian Finals Rodeo, and its historical connection to the Northlands fair grounds. 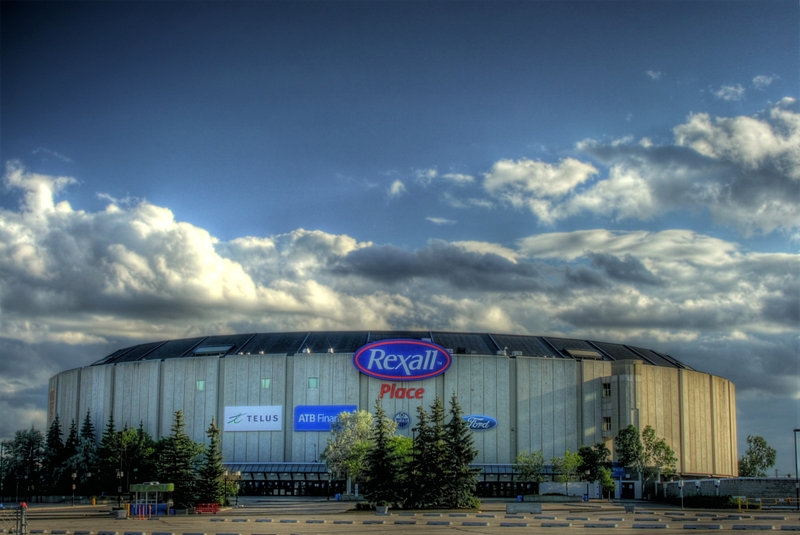 From a individual view, Rexall Place has significant personal heritage value to me. For decades, it was the place I went to see hockey games with my family. In fact, I actually witnessed two of the Oilers Stanley Cup championships – in 1984 and 1988 – from our family’s season tickets in Section K, Row 14. A number of years ago, while completing my doctorate at the University of Alberta, I got to play hockey on the “hallowed ice” of Rexall Place – which was exciting and thrilling and wonderful, even to a grown man. Rexall Place was also where I went to concerts with friends, saw wrestling cards as a teenager, and had my father take me to an occasional monster truck show. Simply put, the arena was part of the landscape of my growing up and living in Edmonton, and I suspect it has become an integral part of many Edmontonians’ personal heritage narratives over the past forty years. In 2016, the Edmonton Oilers will be leaving Rexall Place and moving to a brand new downtown arena. Cournoyer’s blog post explores some thoughts and issues associated with what happens to Rexall Place after the Oilers move. As Cournoyer points out, there hasn’t been much thought about this issue, and argues that local residents have not been consulted as to the arena’s future or how the arena might be used after the Oilers leave. I would add that, part of the consultation about the future of Rexall Place ought to address and assess it’s heritage value, in particular whether the arena’s heritage ought to be recognized and how this heritage recognition would take place. What this may mean for empty stadiums, in fact, is that they are essentially dead landscapes; that perhaps the heritage isn’t in the building itself but the relationship between the building/landscape, the spectators, and the game/performance. Without games being played – in essence, generating new heritage – the buildings themselves may have limited heritage value. Recognizing the heritage value of empty stadiums and arenas has taken different forms, with different levels of success. In situ preservation is probably the least feasible option. Leaving aside ancient sporting monuments, such as the Colosseum in Rome, preservation for preservation’s sake would appear unlikely for any stadium. There are places like Rickwood Field – the oldest baseball stadium in the United States – in Birmingham, Alabama which does not have a core tenant and is probably the best example of preservation for preservation’s sake. That said, the stadium hosts dozens of events each year, from college baseball games and tournaments to memorabilia shows, so it is hardly a “mothballed” stadium. Adaptive reuse of heritage stadiums and arenas is a popular option. Both the Montreal Forum and Maple Leaf Gardens have incorporated numerous heritage elements of the old arenas into new retail, real estate, and education spaces. However, adaptive reuse is not always an option. Tiger Stadium in Detroit was slated for a real estate redevelopment that would have incorporated the old stadium in the development, but plans fell through and the stadium was demolished. Frequently, the old stadium sat adjacent to the new stadium, so some form of heritage markers were often used to denote where the previous stadium was after demolition. The “old” Yankee Stadium in New York is now a park next to new Yankee Stadium, and Fulton County Stadium is parking for the new Turner Field in Atlanta, with both examples denoting important markers from the old stadium in the new space (e.g. : location of home plate, etc.) Sometimes, artefacts from the old building are incorporated into the new building. The scoreboard from the old Omni Coliseum in Atlanta is situated in the foyer of the new Phillips Arena, for example. Of course, many old arenas simply continue on without their core tenants, or perhaps find a different – and often lower tier – sports tenant. The Pacific Coliseum in Vancouver, once the home of the NHL’s Vancouver Canucks, continues as a concert venue, a site for the 2010 Olympic Winter Games, and is the home of the Vancouver Giants of the Western Hockey League (WHL), a junior developmental hockey league. As such, how the venue’s heritage is preserved or recognized may change as well. In the discussions on the future of Rexall Place, the heritage of the venue should be raised – and, depending on the future use of the building, how the heritage is recognized will be a key issue. I also think that the heritage of the venue isn’t just the Oilers, but encompasses many different forms – including personal heritages. I would imagine that the venue will end up in some sort of adaptive reuse project – I simply can’t imagine it being preserved in situ, nor can I see it continue without its core tenant given the population size of Edmonton. That said, I hope the good citizens of my former hometown consider a broad range of cases in how to use the venue going forward while still recognizing and acknowledging its heritage value. By Gregory Ramshaw in Uncategorized on December 12, 2014 .